By the way, I was also about to purchase a 43'' collapsible umbrella but it seems that the 45'' (non collapsible) model is more durable. Unfortunately, the LP633 (and identical Calumet MF6829) have taken a turn for the worst. 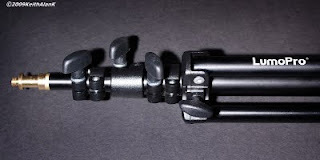 The current versions boast a feature which tilts the umbrella shaft up 10-degrees so that a flash points into the center of the umbrella (a great concept which MPEX specifies on their site but which Calumet email support has yet to realize they have - even though this model is in at least one Calumet store). The new models are identified by the triangular groove running the length of the umbrella shaft hole on the side opposite the thumbscrew. The product photos on either site show the old design with the cylindrical and groove-less hole. I returned all of the LP633s I ordered and after the first three I checked at Calumet proved similarly bad, I stopped looking. 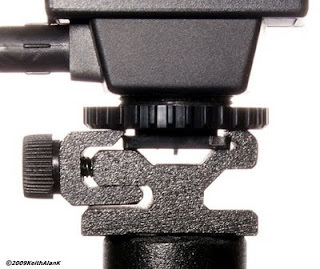 It's a shame because these are otherwise well designed units with their metal construction and great hot-shoe clamp. "However the hole for the shaft is no longer cylindrical but is tapered. As a result, when tightened down, the umbrella shaft points to the side rather than straight ahead. 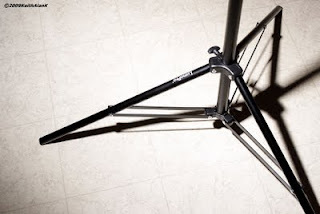 So much for the attempt to center the flash pattern within the umbrella..."
I bought 3 of these stands recently and am very surprised and pleased with the build quality. The work as intended and look to last a very long time. I also like how the LumoPro LP633 Umbrella Swivel w/ Flash Shoe Adapter states that they are designed to accomodate both the Nikon SB600 and the larger Nikon SB900. 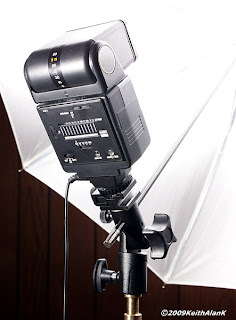 I believe these flash shoe adapter could handle any strobe. The strobe can slide in either direction and locks down firmly.